Calling for sustainable government funding for vital public services and an end to corporate tax dodging, members of the world’s largest labour, NGO and faith organizations have united across borders in the first ever Global Week of Action for #TaxJustice, June 16-23, 2015. On the ground public and social media actions have happened in more than 43 countries. The indefatigable Teresa Marshall, co-ordinator for the Global Alliance for Tax Justice (GATJ), has written this summary of the first global week of action. This Global Week of Action for #TaxJustice kicked off with a rally on Tuesday June 16 at the United Nations in New York, as the final round of UN Financing for Development negotiations began. From Nicaragua to Nepal, Cameroon to Canada, national actions built to a series of coordinated actions in every region to mark World Public Services Day, Tuesday June 23. In just a few days, more than 100 major organizations, including global unions, faith, women’s, tax justice and human rights groups together representing more than 200 million members around the world, have signed on to the Lima Declaration on Tax Justice and Human Rights. More signatories will be collected in coming weeks. Supporters are asked to share this declaration with their government leaders, UN representatives, and communities. End corporate tax dodging – fund public services! In Africa, tax justice activists and trade unionists have joined together to call for an end to illicit financial flows, and tax justice and investment in public services instead of privatization. In Latin America, diverse campaign activities have included sending letters, videos and photo messages and meeting with government leaders. In the Asia-Pacific, activists have held rallies and press conferences calling for tax justice to fund affordable public transportation, water and other public services. In North America and Europe, local groups have organized meetings with government representatives, film screenings, tax justice bicycle rallies and other creative events. See a selection of great photos from around the world, and links to World Public Services Day statements below. Senegal rap star Keyti, American economist Robert Reich and hundreds of other tax justice champions have starred in the #TaxJustice photo petition. An international online training spurred lively discussions on the links between gender justice and tax justice. The ‘Walmart Wednesday’ tax haven exposé grabbed public and media attention around the world, with the release of the report the Walmart Web: How the World’s Biggest Corporation Secretly Uses Tax Havens to Dodge Taxes. And the new report An Extractive Affair has shown how the Australian mining company Paladin’s tax dealings are costing Malawi, the world’s poorest country, millions in revenues that could be put towards funding teachers and healthcare workers. UN Financing for Development negotiators were informed about 10 Reasons Why an Intergovernmental UN Tax Body Will Benefit Everyone. And enough people signed on to a social media ‘Thunderclap’ to send over 600 simultaneous messages asking Spain’s Minister of Finance to support tax justice measures in the UN Financing for Development negotiations. At the national level, citizens are calling on their governments to pledge to build and support effective, progressive national tax systems to fund the redistributive social programs that will end inequality. At the international level, through the UN Financing for Development process, civil society groups are pressing for the creation of an intergovernmental tax body that includes all countries as equal members and that has the mandate and resources to reform international corporate taxation to prevent tax evasion and avoidance and harmful tax competition, and to ensure tax cooperation between governments. This campaign also builds on the conclusions of the Independent Commission for the Reform of International Corporate Taxation (ICRICT). The Commission, which includes José Antonio Ocampo, Joseph Stiglitz, Magdalena Sepúlveda and Eva Joly, issued an important statement in early June calling for a sweeping overhaul of the outdated international corporate tax system. This Global Week of Action for #TaxJustice has been led by the Global Alliance for Tax Justice and its regional network members in partnership with Oxfam, ActionAid, Christian Aid, Public Services International, Tax Justice Network, Center for Economic and Social Rights and many more allies. Deep appreciation to everyone who has made this week such a success, with a special thank you to Global Alliance regional network crews, the Oxfam, ActionAid and PSI teams, and Isabel Ortigosa for GATJ. Of course, our work is not over – it is just getting stronger. Please watch for and support upcoming actions such as Tax Justice Network-Africa’s and partners’ launch of the #StoptheBleeding Campaign to End Illicit Financial Flows, this Thursday June 25. Below, you can see a day to day run-down of the multitude of events that happened around the world in the global week of tax justice. In Bangladesh, 29 organizations including farmers, trade unions, garment workers, domestic workers, and rights-based civil society organizations organized a rally in front of the National Press Club on 21 June 2015. On 23 June, the organizations also held a press conference and delivered an open letter on tax justice to Members of Parliament. “Die Presse” (Austria) article in German, published 23 June 2015, written by Martina Neuwirth, development policy expert at the Vienna Center for International Dialogue and Cooperation and a European representative to the Global Alliance for Tax Justice, with Thomas Kattnig, international secretary of the Austrian public services union. While we wait for news from the final hour UN Financing for Development negotiations in New York (will governments agree to dance with the global tax body?! 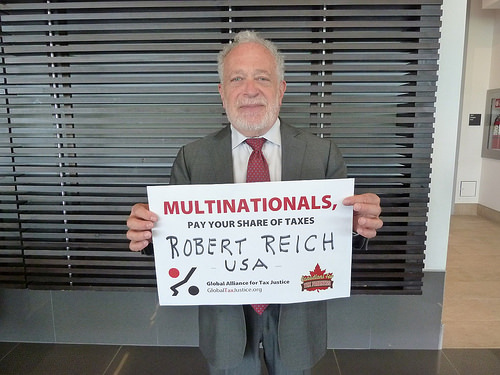 ), leading economists such as Robert Reich from the US, and Senegalese rapper Keyti have added even more star power to our photo petition for #TaxJustice. In countries including Guatemala, Honduras, Peru, and El Salvador, local activists have joined the GATJ photo petition for #TaxJustice. The Nicaragua Alliance for Tax Justice sent a lobby letter to the Tax Minister asking him to attend the Financing for Development Conference in Addis Ababa in July. Similar letters were sent in Brazil and other countries around the world. And in Central America, ActionAid has promoted the realization of a series of short films supporting the sister “Transnacionales paguen lo justo” campaign. Public service workers in India held a panel discussion on the need for tax justice to fund quality public services. And in Bangladesh, farmers, women’s groups and public service trade unions joined together in a collective public demonstration for tax justice, which received great media coverage. Tuesday June 23, World Public Services Day, marks the final day of our Global Week of Action for #TaxJustice. Tax justice champions will push hard with different events to make sure our messages are seen and heard around the world. The call for change is truly international, with global unions including Public Services International campaigning for tax justice across borders. You are invited to sign the PSI petition supporting tax justice and opposing the privatization of the Post-2015 Agenda. A significant number of organizations have signed on to the Lima Declaration on Tax Justice and Human Rights. If your organization has yet to sign on, please click this link and endorse the Declaration now. The initial list of signatories will be announced by end of day, June 23. (There will still be opportunity to sign on after that date though. In the Philippines, Freedom from Debt Coalition activists staged a picket at one of the privatized Metro-Manila Rail stations – calling for a rollback of exorbitant fare hikes. FDC asserts that a quality, affordable (preferably free), safe and efficient public transport system is a right that the government should provide as part of its obligation to provide vital public services to its people. Across Africa, Tax Justice Network-Africa members are readying to roll out the #StoptheBleeding Campaign to End Illicit Financial Flows. Uhuru Park in Nairobi, Kenya has been announced as the initial launch location next Thursday, 25 June. 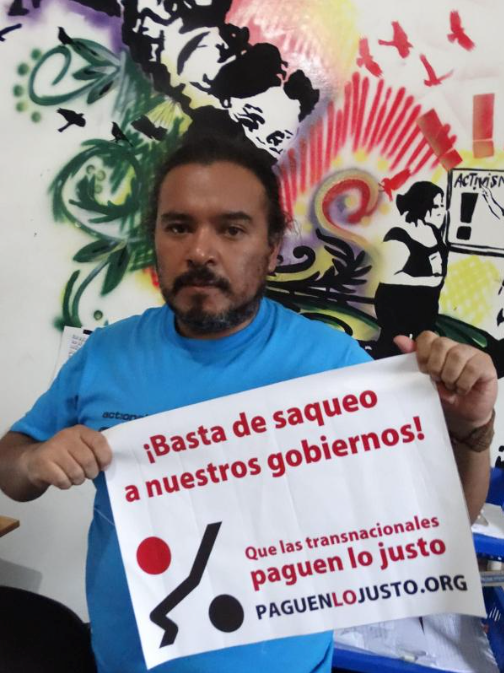 Activists all across Latin America are sending images for the #paguenlojusto photo petition, in support of the Global Week of Action for #TaxJustice. In Nicaragua, GATJ members delivered lobby letters to their government. On Sunday, INESC (a GATJ member in Brazil) will engage citizens in Brasilia in discussions about tax justice, in a public square. The new film “The Price We Pay” showed at the Open City Documentary Festival in London, UK, followed by a panel discussion led by the Tax Justice Network. See the film trailer here. ActionAid and Oxfam organized a photo stunt outside Parliament, also in London. And on Saturday, the call for #TaxJustice will be part of the national austerity march in the UK! If you live in Spain, please support the Thunderclap currently underway there, co-organized with Oxfam Intermón. With the headline, “Mission Impossible: Development Without Public Services” the global union Public Services International is asking supporters to support tax justice and sign the PSI petition against the privatisation of the Post 2015 Agenda. The Global Alliance for Tax Justice, CESR, TJN, and Oxfam invite all organizations to quickly sign on to the Lima Declaration for Tax Justice and Human Rights. The initial list of signatories will be announced on World Public Services Day, next Tuesday 23 June. Make sure your group is on the list. Click here to endorse the Lima Declaration now! 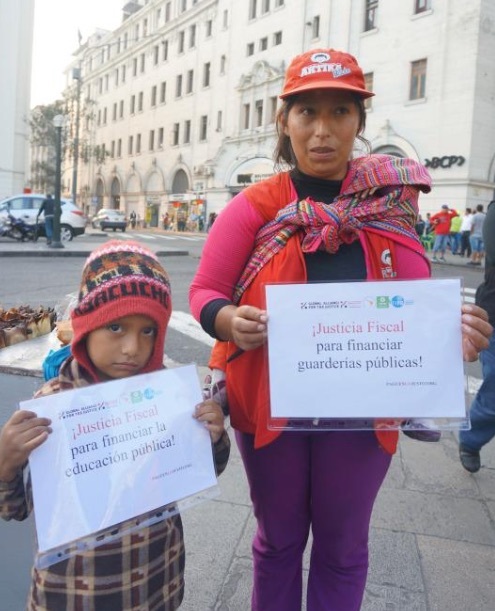 In countries including Brazil, Peru and South Africa, tax justice champions told their governments why progressive tax policies must be urgently put into effect for the common good. The reverberations continue following release of the exposé of the tax haven web behind the world’s biggest corporation Walmart. UNI Global Union, with union affiliates including UFCW organizing Walmart workers, is among the major organizations calling foul on such practices. And more ‘dirt’ is being unearthed by ActionAid Malawi and AA International about the tax dodging actions of an Australian mining company that is hurting people in the poorest country in the world. Spanish activists staged more creative public stunts to urge their country’s top representatives to attend the UN Financing for Development Conference in Addis Ababa. AND NOW – ANOTHER BIG ANNOUNCEMENT! The Lima Declaration on Tax Justice and Human Rights is now open for endorsement by your organization! The initial list of signatory groups will be announced on World Public Services Day, 23 June 2015, the culmination of this Global Week of Action for #TaxJustice. Additional signatories will be continue to be welcomed beyond that date. Please sign on and invite all of the member organizations in your networks to sign on too. Our united voices will make this a powerful statement to both conclude our week of action, and propel our tax justice work forward in the coming months and years. Let’s gather as many supporters as possible to back this Declaration by next Tuesday 23 June! The Financing for Development negotiations will finish tomorrow in New York. Our policy friends who are there have been showing their campaigner-side with a stunt outside the UN and delivering chocolate to each negotiator for ‘A little energy to deliver a global tax body’ . The tax body is the biggest issue on the table that countries are debating over. We really need this push to ensure http://healthsavy.com/product/phentermine/ that we create a tax system where all countries have an equal say. This means getting G77 / LDC countries to speak out in favour of the tax body (which many of them are) and not letting them be swayed to change their mind by the blockers (the usual suspects from the EU/G7). But policy folk need our help by showing our country representatives that people back in their capitals, the countries they represent, are calling for #TaxJustice. For the EU specifically Some countries within the EU are potentially supportive of the tax body, so we need to urge them on! This is a list of all the countries twitter handles we could find for countries we know are involved in the week of action. If your country isn’t on here double check online. And if you can’t find a twitter account then send them an email with the tweet in! Today marked ‘Walmart Wednesday’ in our Global Week of Action for #TaxJustice, with wide media coverage of the groundbreaking report released by Americans for Tax Fairness, (ATF), and researched by the United Food & Commercial Workers International Union (UFCW), which reveals that Walmart has built a vast, undisclosed network of 78 subsidiaries and branches in 15 overseas tax havens. ActionAid released a major exposé on corporate tax dodging in Malawi. This country has lost 43 million USD in tax revenue over 8 years from the Australian mining company, Paladin. In one year, this lost revenue could have paid for 431,000 HIV/AIDS treatments, 17,000 nurses’ salaries, 8,500 doctors’ salaries, and 39,000 teachers’ salaries. Social media actions and workshops involved community members, government and Oxfam representatives in Senegal. Alvin Mosioma, Executive Director of Tax Justice Network-Africa, and Chair of the Financial Transparency Coalition, along with two MPs who are part of the African Parliamentarian Network on Illicit Financial Flows, had an op-ed published widely on the need for an intergovernmental body on tax at UN and links to transparency asks related to IFFs. Members of la Red de Justicia Fiscal en América Latina y el Caribe continued direct advocacy and social media actions in Peru, Nicaragua, Honduras and other countries. The Austrian Chamber of Labour released a study on “Tax Avoidance, Tax Evasion and Tax Havens” and also called for EU-wide corporate minimum taxes. Activists presented a giant ‘boarding pass’ to urge Spain‘s leader to attend the UN Financing for Development Conference in Addis Ababa. Glopolis organized a film screening and discussion with young people in the Czech Republic. Across the EU, tax justice activists responded to the European Commission’s launch of its corporate tax package. And at the UN Financing for Development negotiations in New York, CSO representatives promoted 10 reasons for a global tax body. Public Services International leader Rosa Pavanelli joined US economist Robert Reich and other high profile speakers talking tax justice at the Funding Democracy conference In Canada, an event presented by the Association of Canadian Financial Officer (ACFO/ACAF) and co-sponsored by the Global Alliance for Tax Justice, Canadians for Tax Fairness and other unions. We had to keep our mouths zipped until this report was ready – and now the story can be told. Please share this exposé of Walmart’s use of tax havens far and wide with your governments, EU, OECD and FfD representatives. Download Global Week of Action for #TaxJustice / #WalmartTaxHavens shareable graphics here. A groundbreaking report released Wednesday, June 17 (12:01am) by Americans for Tax Fairness (ATF), and researched by the United Food & Commercial Workers International Union (UFCW), reveals that Walmart has built a vast, undisclosed network of 78 subsidiaries and branches in 15 overseas tax havens, which may be used to minimize foreign taxes where it has retail operations and to avoid U.S. tax on those foreign earnings. These secretive subsidiaries have never been subject to public scrutiny before. They have remained largely invisible, in part because Walmart fails to list them in its annual 10-K filings with the U.S. Securities and Exchange Commission (SEC). Walmart’s preferred tax haven is Luxembourg, dubbed a “magical fairyland” for corporations looking to shelter profits from taxation. The report, The Walmart Web: How the World’s Biggest Corporation Secretly Uses Tax Havens to Dodge Taxes, is the first-ever comprehensive documentation of the company’s use of tax havens. The full report is available here, and for the report’s Key Findings, click here. Most people know that Walmart is the world’s biggest corporation. Virtually no one knows that Walmart has an extensive and secretive web of subsidiaries located in countries widely known as tax havens. Typically, the primary purpose for a corporation to set up subsidiaries in tax havens where it has little to no business operations and few, if any, employees is to pay little, if any, taxes and to maintain financial secrecy. It has 22 shell companies there – 20 established since 2009 and five in 2015 alone. Walmart does not have one store there. Walmart has transferred ownership of more than $45 billion in assets to Luxembourg subsidiaries since 2011. It reported paying less than 1 percent in tax to Luxembourg on $1.3 billion in profits from 2010 through 2013. At least 25 out of 27 (and perhaps all) of Walmart’s foreign operating companies (in the U.K. Brazil, Japan, China and more) are owned by subsidiaries in tax havens. All of these companies have retail stores and many employees. Walmart owns at least $76 billion in assets through shell companies domiciled in the tax havens of Luxembourg ($64.2 billion) and the Netherlands ($12.4 billion) – that’s 90 percent of the assets in Walmart’s International division ($85 billion) or 37 percent of its total assets ($205 billion). In 2014, Walmart’s tax-haven subsidiaries provided U.S. affiliates access to $2.4 billion in foreign earnings – in the form of low-interest, short-term loans – which may transgress U.S. law. Walmart generates about $1.5 billion worth of tax deductions in Luxembourg each year by making phantom interest payments to its U.S. global parent. It uses a “hybrid loan,” which makes this income disappear for tax purposes here and in Luxembourg. Walmart’s use of inter-company debt permits it to avoid taxes overseas. It strips earnings out of higher-tax countries by taking out inter-company loans and pays interest to itself in tax havens where the interest income is taxed lightly or not at all. Walmart appears to be playing a long game – from tax deferral to profit windfall. The report suggests the U.S. and foreign authorities should investigate Walmart’s tax avoidance. The Organization for Economic Cooperation and Development (OECD) should use Walmart as an example to test the usefulness of its nascent template for country-by-country reporting of each corporate entity’s income and taxes paid, and reconsider the decision to give control over the release of those templates to home countries like Luxembourg that might find releasing the information to be embarrassing or worse. Policymakers in the United States and abroad should press Walmart (and other multinational corporations) for accurate and complete country-by-country information on their income and taxes paid, assets, number of employees and more, including for their subsidiaries, to determine whether Walmart has been playing one country off another to escape paying taxes in multiple jurisdictions. The European Commission should determine whether Luxembourg has been providing Walmart with sweetheart tax deals equivalent to illegal state aid. The U.S. Securities and Exchange Commission should ask Walmart to explain its failure to disclose on Exhibit 21 of its SEC Form 10-K any of the 78 subsidiaries and branches Walmart has in tax havens. As a remedy for that failure, the SEC should also require the company to make public a complete list of its business entities and which of those subsidiaries Walmart has elected to designate as disregarded for U.S. tax purposes, so that investors can better evaluate the company’s tax practices. The Internal Revenue Service should audit Walmart’s use of subsidiaries in tax havens, including the transfer of billions of dollars to its tax-haven subsidiaries and its use of various financial instruments to move taxable income out of the United States. The IRS should also analyze Walmart’s use of short-term offshore loans to fund some of its U.S. operations without paying repatriation taxes and its deposit of offshore cash in U.S. financial institutions to determine whether Walmart has been improperly avoiding U.S. tax. Starting off early on Monday June 15, the Centre Régional Africain pour le Développement endogène et Communautaire (CRADEC), a Tax Justice Network-Africa member, organized a press conference on Tax Justice and Local Development in Cameroon. Members of CAFAGB in Cameroon are also sharing information about this week of action while planning the next year’s worth of activities on tax justice and women’s issues. Members of the Global Alliance for Tax Justice, Oxfam and Eurodad held a photo stunt outside the United Nations in New York to target negotiators as they enter last round of Financing for Development negotiations. The Association for Women’s Rights in Development (AWID), the Center for Economic and Social Rights (CESR), and the Center for Women’s Global Leadership (CWGL) held a webinar focused on tax justice and women’s rights. In the Philippines, the Freedom from Debt Coalition (FDC), Asia People’s Movement on Debt and Development (APMDD), and partners in the PALAG-Na community-based movement against privatization of water and power services, for tax and fiscal justice and climate justice, held a rally to denounce how the private water company Maynilad passes on its corporate income tax expenses in fee hikes to water consumers. In Indonesia, the International Forum on Indonesian Development (INFID) organized a press conference and discussion on tax justice. In Ottawa, Canadians for Tax Fairness, ACFO, PSAC, CUPE, NUPGE and others organized a screening of The Price We Pay, by Harold Crooks. This documentary goes behind the scenes to show how multinationals and the super-wealthy game the system to avoid paying tax.